Scientists in multiple disciplines at The Ohio State University are delivering solutions to potential health problems and industry concerns associated with harmful algal blooms—in Lake Erie and inland lakes, as well as around the world. 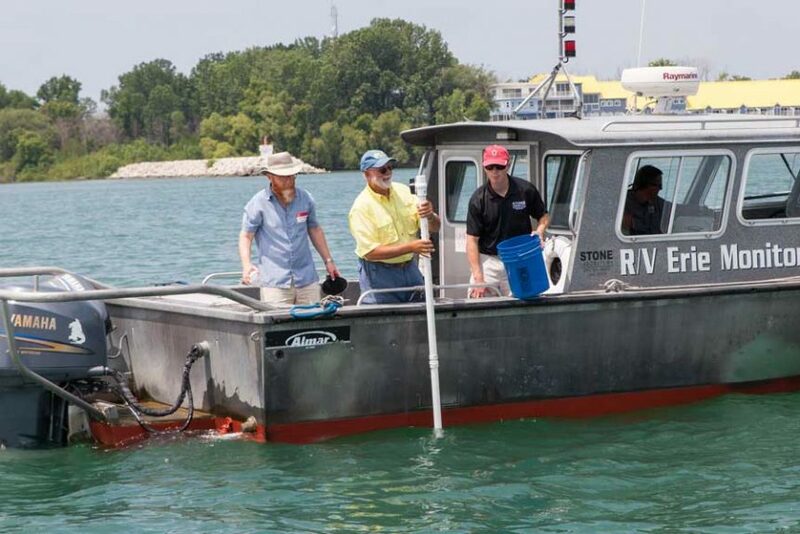 Ohio State researchers are part of the Harmful Algal Bloom Research Initiative (HABRI), a statewide response to harmful algal blooms established by the Ohio Department of Higher Education (ODHE) in 2014. Ohio Sea Grant, on behalf of Ohio State, the University of Toledo and ODHE, released the annual report today for the second year of HABRI funding. Eight additional colleges and universities across Ohio participate in this initiative. Harmful algal blooms (HABs) are an annual issue for water bodies across the state and beyond, jeopardizing water sources and causing health concerns with certain chemicals that they emit. After a harmful algal blooms affected the drinking water for over half a million people on Lake Erie in 2014, the state of Ohio took an integrated, systems approach to the problem with the Harmful Algal Blooms Research Initiative. As part of its role as integrator of Ohio State University and State of Ohio assets, the Global Water Institute has played a leadership role in HABRI since the initiative launched in 2015. GWI Executive Director Marty Kress co-leads the university consortium with Tom Bridgeman at the University of Toledo and Chris Winslow at Ohio Sea Grant. The initiative is currently seeking a new round of project proposals based on the critical needs assessment of four state agencies: Ohio Environmental Protection Agency (OEPA), Ohio Department of Agriculture (ODA), Ohio Department of Health (ODH), and Ohio Department of Natural Resources (ODNR). Learn more about Ohio State researchers’ work toward HABs solutions.